Sam Halliwell has a problem. He is the CEO of a drug company whose latest product has the unfortunate side effect of attracting rodents. Customers are unhappy. He needs something new to distract them. His star researcher, who had been developing a promising love vaccine, has jumped ship. What remains of his lab is located in a spooky swamp among dying trees. Things aren’t looking good. Rocky Wise, a research assistant, has locked himself up in the lab and is trying to perfect the love vaccine. He is passionately devoted to the task, having been dumped by scientist Grace Wright and determined never to fall in love again. He really wants the vaccine. Needing a senior scientist to rescue the project, Sam has lured Grace to return to his lab. Grace would never work on a love vaccine, however, so Sam has lied and told her she’ll be developing a love potion instead, a drug that will facilitate people falling in love. This is a setup that raises plenty of questions: is love an illness? is it really better to have loved and lost then never loved at all? should we be manipulating personalities with drugs? where will it end? Playwright Patricia Milton has good comic chops and there are plenty of laughs to be found in this light hearted romance. Actors Casey Fern and Maria Giere Marquis are charming as Rocky and Grace, the battling researchers. Jon Fast and Kate Jones in Wily West Productions premiere of Believers by Patricia Milton. Photo by Jim Norrena. Jon Fast as CEO Sam Halliwell has some funny moments, but his performance is hampered by overplaying. Desperation does not have to be loud and his unremitting shouting is disconcerting. Kate Jones, a skilled sketch comedian, is also funny as a born again receptionist whose obsession with scripture has done little to calm her wild sexuality. “It’s been a while since anybody hid baby Moses in my bulrushes,” she complains at one point, and her meaning is unmistakable. This is the first production of Believers. It is clearly stage worthy and deserves repeated productions. It would be better served with a more nuanced style of acting, less influenced by sketch comedy. The production is nicely enhanced by the incidental music provided by guitarist Rick Homan. Overall, Believers delivers some interesting comic reflections about love in an easy-to-swallow sugar coated pill. 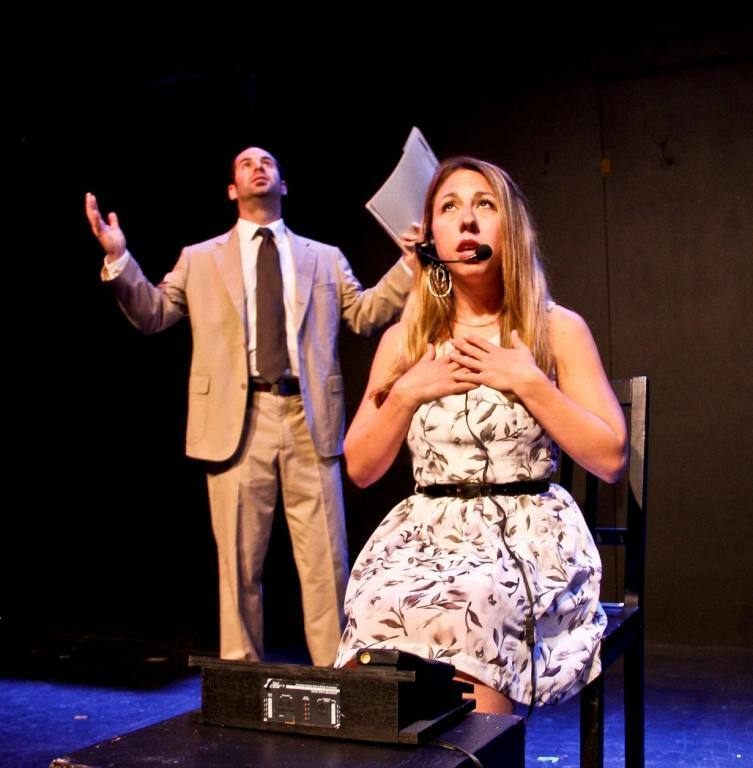 Performances continue through August 25 at Stage Werx on Valencia. For further information, click here. “Believers” by Patricia Milton, produced by Wily West Productions. Diretor: Sara Staley. Lead Designer: Quinn J. Whitaker. Costumes and Props: Anya Kazimierski. Technical Director: Wes Cayabyab. April May: Kate Jones. Sam Halliewell: Jon Fast. Rocky Wise: Casey Fern. Grace Wright: Maria Giere Marquis. Posted in Reviews.Tagged Believers, Casey Fern, Jon Fast, Kate Jones, Maria Giere Marquis, Patricia Milton, Rick Homan, Sara Staley, Stage Werx, Wily West Productions.